University of Illinois Crop Sciences Professor Andrew Leakey shows off a soybean field at the SoyFACE facility in Savoy, Ill. The negative effects of climate change on Illinois soybean farmers will likely be greater and come sooner than originally thought, new research at the University of Illinois has found. The study, led by crop sciences professor Andrew Leakey, contradicts the widely held belief that increased carbon dioxide in the atmosphere will boost the yields of crops. Researchers found that in ideal growing conditions, carbon dioxide boosts crops’ yield, but in years of drought, the damage offsets those benefits. “The expectation before was actually the opposite. In wet years, you would get some benefit. In dry years, you would get even more benefit from the CO2,” Leakey said. 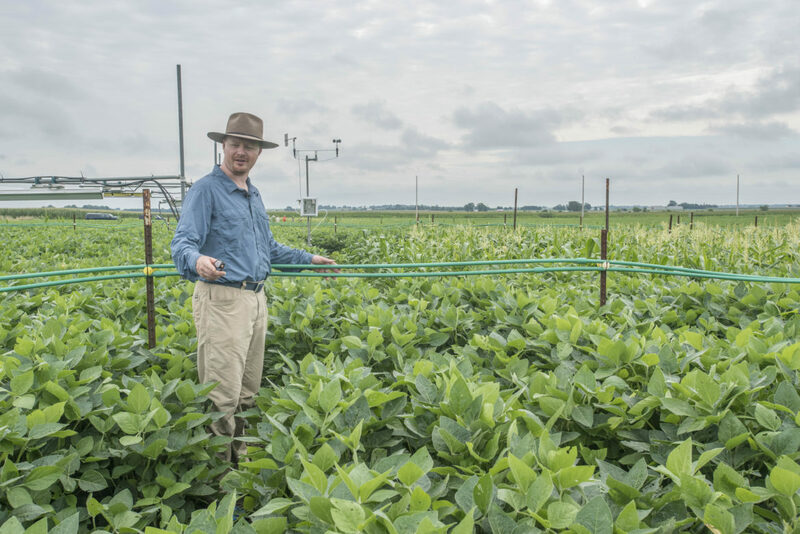 Leakey’s team of researchers at the Soybean Free Air Concentration Enrichment Facility, also known as SoyFACE, spent eight-year studying soybean crops under different simulated growing conditions. While higher carbon dioxide levels act as a fertilizer causing the plant to grow larger, they also reduce the size of the pores in plant’s leaves, which lessens the loss of water through exchange of gases in the air, according to the study, which was published in the journal Nature Plants. But researchers also found that when the plant to grows larger in the early growing season — when there is usually more rain — by the time a drought sets in, the plant has overextended itself and is unable to get enough water to sustain itself. Additionally, soybean plants become more sensitive at higher carbon dioxide levels, meaning they’re more likely to decline in response to stress. The plant’s nodules that absorb nitrogen also don’t work as well in dry soil. The loss in these years will offset the gains in years with improved yields resulting in no overall yield gains, or possibly even yield losses. From a farmer perspective, Leakey said that it would be possible that irrigation of soybean fields could mean increased yields but that’s a decision that farmers would have to make. “Certainly, that’s what one potential implication would be if you’re willing to pay the environmental and ecological costs,” Leakey said. He said he wasn’t sure whether it would become a reality, however. Leakey said that the length of eight years was coincidental, but it helped researchers get enough different types of growing conditions to see how higher carbon dioxide levels would affect soybeans. Leakey said that while this study isn’t good news for farmers, the value of this study is that now researchers know that carbon dioxide won’t benefit plants in years of droughts and can study ways to help address future yield issues. Leakey, who has led most of the corn research at SoyFACE, said that he doesn’t anticipate a similar effect in corn because it has a different type of photosynthesis. Corn is already more efficient, so the plant likely won’t grow much faster earlier in the year, meaning it won’t be any worse off in years of drought.